This cleansing milk from Lotus herbals comes packaged in a sturdy plastic cylindrical bottle with a pump dispenser. The yellow colour packaging looks nice and the pump facilitates easy dispensing of product. This bottle is pretty huge but you can get the smaller version for travel purpose. I use this cleansing milk in the night to free my face of makeup and dirt. The product has a creamy texture and is light yellow in colour . 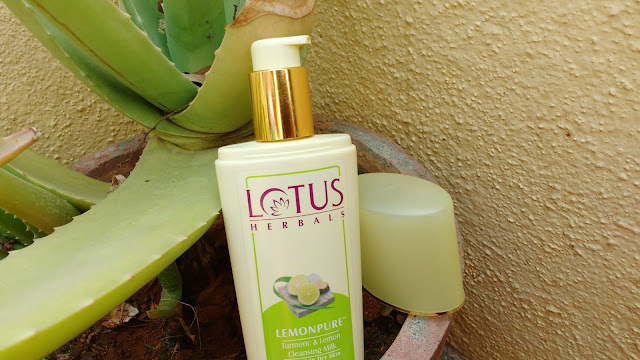 When I apply Lotus Herbals Lemonpure Cleansing Milk on my face there is a very strong lemony turmeric smell which I am okay with but it may bother sensitive noses. A little goes a long way with this cleansing milk and I need just pea sized amount to cover my entire face after which I wash off with water as I am too lazy to use damp cotton! Every bit of my normal makeup comes off after using this product and I am left with a cleansed feeling. I use the lemonpure cleansing milk even around my eyes and it doesnt sting eyes (lakme cleanser stings) but removes all eye makeup like liner, shadow and mascara. My skin doesnt feel dry or stretchy after using this which is amazing and I am loving using this cleanser in winters. 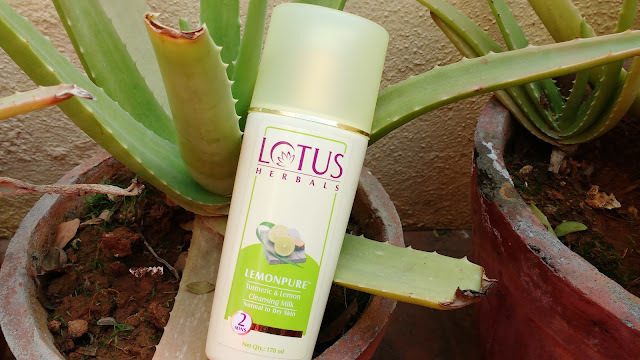 There is a slight oily film left behind after using this cleanser so it is definitely meant for normal and dry skinned beauties but oily skinned beauties can give it a try in winters. Yes, to all women with dry and normal skin. Not for oily skin though. Overall this lemonpure cleansing milk from Lotus Herbals removes every bit of my makeup without making my skin dry. This is my favourite cleanser and all dry or normal skinned beauties should give it a try. Good value for money product.